If you were tasked with redesigning your life, and you had nothing to lose, what would you change? It wasn’t until about a week ago that I started thinking like this. Until then, the whole process of reconsidering what it is we’re doing was based upon the assumption that financial growth was a prerequisite, and that in turn meant expanding the company in some way. But then, we dared to question that assumption. What if financial growth wasn’t a necessity? What if we forgot all about money, and instead looked into our hearts and asked ourselves, what do we really want to do? It took a couple of days for that idea to sink in, but when it did, well, it changed the process completely. The walls that had previously defined the limits of our options vanished. We were free to dream our biggest dreams. Whilst liberating, it’s also led to a place where we are faced with our greatest fears. Fears that are linked not with the fortunes of a superficial company, but rather, with our core sense of identity. It’s like stripping away the layers of protective clothing and getting completely naked. Showing who we really are. This last week I’ve started sharing my blurry ideas for a new way forward with a limited number of close friends and family. I see that this is my attempt to get reassurance that I am not totally wrapped up in some ga-ga land of my own creation, but that others recognise the potential that I see. I shouldn’t need this reassurance – i should trust in my own gut feeling that this is the right thing to do (it’s a strong feeling I have had for years, decades even). I would add that I have been pretty bowled over by the sheer kindness, consideration, and votes of confidence shown by those I have spoken to. I am immensely grateful for that. Much of this weekend will be spent examining how my core passion can be translated into real-life actions, and how it can be made to be sustainable. 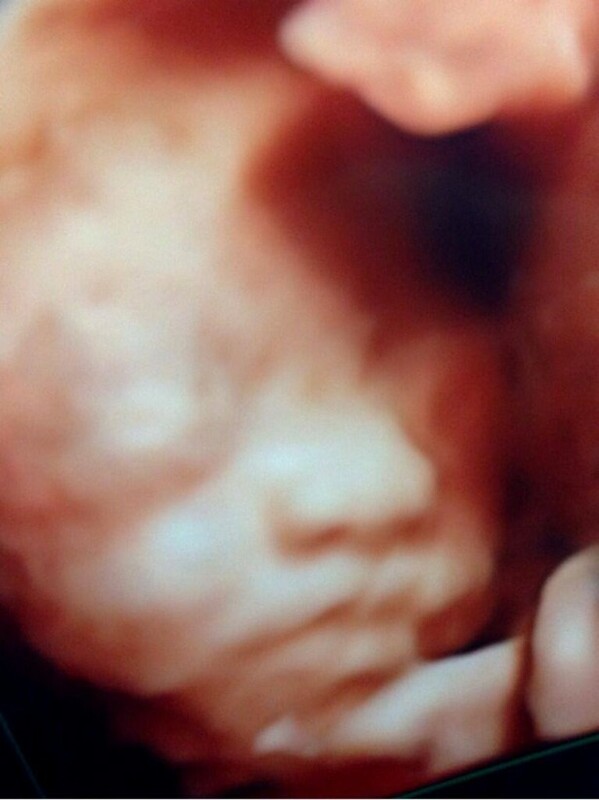 Here’s what a 25-week-old unborn Tame child looks like – meet our son! He does actually already have a name but I am told by TwinkleTame that this is still strictly confidential and not to be shared on the interwebs. I can tell you though that it is a boy’s name and works well in both English and Japanese. And more importantly it’s a cute name that suits him. These images – still shots taken from a DVD video we were given by the 4D scanning clinic we visited a couple of days ago – show him pretty much as he will be when he’s born in early October. He’ll have a little more flesh around the side of his cheeks, but all the important bits are already there. Including his willy, which he was only too happy to play with whilst the camera was on him, cheeky chap. 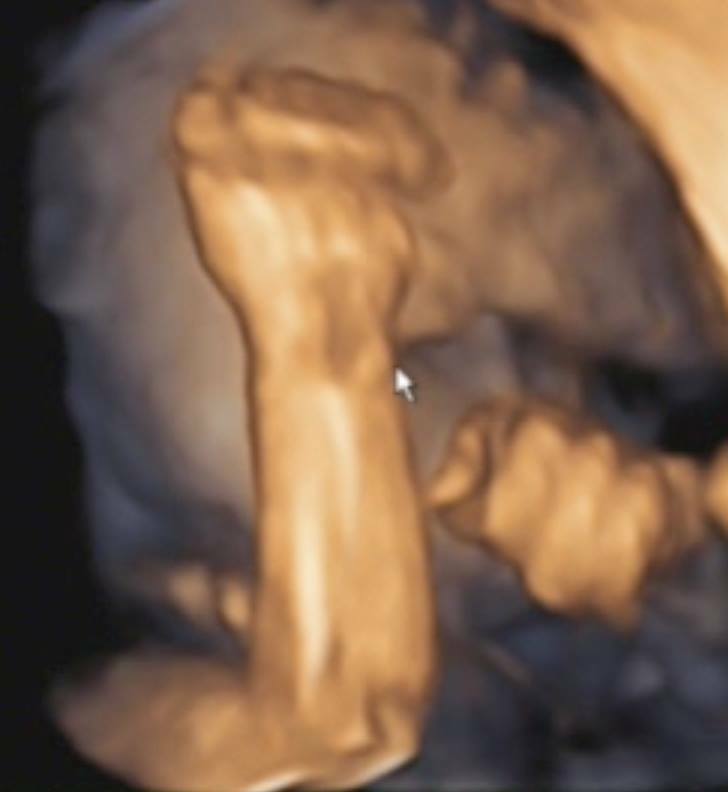 – the ultrasound machine, which produced these incredible images. The doctor was fantastic, given us a full guided tour of our little fella over the course of a 20 minute consultation. He even translated some medical terms for me as he made his way around. The other thing i noticed was just how much he looks like his mummy! 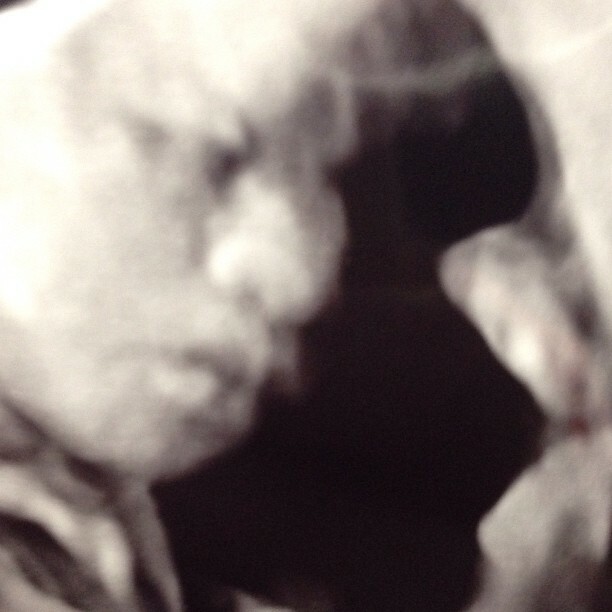 He has mummy’s nose, mummy’s lips, and mummy’s ears. Still, I think she is far better looking than me, so that’s OK.
He’s on a 6-minute sleep cycle at the moment (I hope that changes by the time he’s born…), and is pretty active both day and night, jumping around, prodding mummy. However, it seems I have a calming effect upon him (one would expect the opposite to be honest) – he soon quietens down when I lay my hand on mummy’s stomach. Now that’s something that I hope doesn’t change after he’s born. Whilst I’m trying to prepare myself psychologically for the changes ahead, I am reassured by many friends who are already parents that no matter what I do I will still be totally unprepared when he pops out, and our lives will be turned completely upside down. 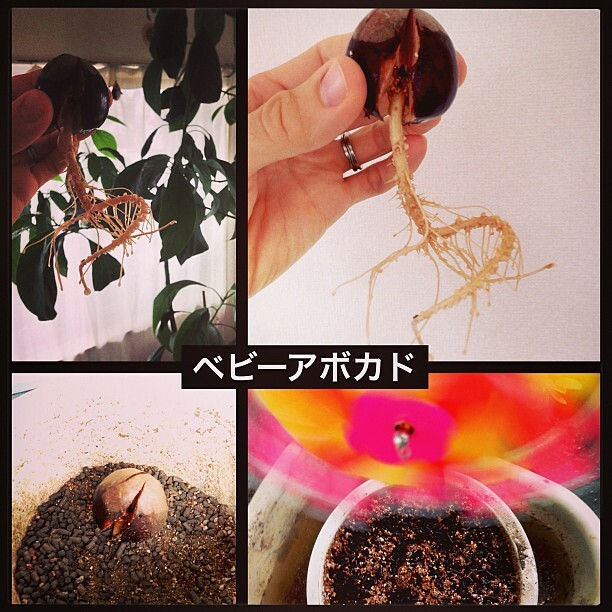 I ‘planted’ this avocado stone in a jar of water about a month ago, put it at the back of the shelf above the kitchen sink, and then forgot about it, being preoccupied by a deluge of work. It was only when the shelf was emptied of cups a couple of days ago that I remembered it was there, and discovered that it had sprouted a huge tap route. But there was no shoot emerging from the top – and without deliberate conscious action to move that seed to a nutritious soil-filled environment, the shoot would never emerge. Last night, Twinkle and I met up with an old friend from our university days to get his opinion on our business plans. It was the 5th such meeting this month, whereby we’ve reached out to someone whose work we admire and who’s attitude towards life we respect, and who, more often than not, runs their own business. 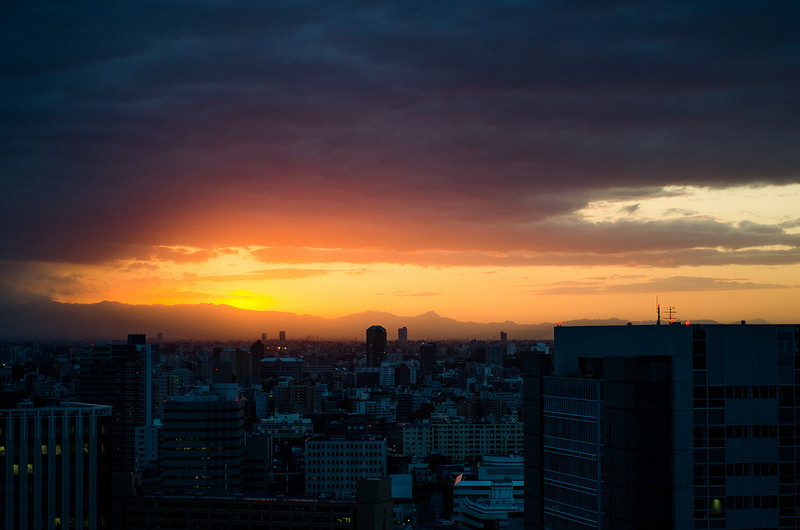 It’s approaching 5 years since we returned to Japan to start a new life. Looking back I’m proud of what we’ve achieved, in my case going from a job teaching English over the phone (which I must admit did my head in) to being the owner of a small media production company doing work I enjoy, on a daily basis. I’ve been through a few distinct phases, each of which has played a key role in shaping the future I’m now living. These include a year working for a small publishing company, a year as a freelance IT consultant and project coordinator, a year working at a respected video-production company, and then the past 10 months spent running my own digital media production business. Aside from the above roles, I’ve also co-managed the TEDxTokyo media team, run 5 marathons, made numerous mainstream media appearances as myself (with windmills on my head), given many presentations at events in Japan and overseas, and become a recognised (and dare I say it liked) figure in the Japanese running world. I’ve also been the grateful recipient of a lot of support from an amazing community of folks from all walks of life – this is in stark comparison to the extremely limited circle of friends I had when I lived in Japan from 2001 to 2003. On the family side, Twinkle and I are very happy together and expecting our first child, whilst we live in a home that right now is exactly the kind of home we want to live in! It’s coming up for two years since I established Wild Tame Co., Ltd. The decision to found the company came naturally – it was something I had always wanted to do, and the benefits (mainly connected with tax but also as being a limited company gave us the ability to work with larger clients) made it a obvious choice. My day-to-day work pattern didn’t really change, with my existing clients continuing to keep me busy. 2 years on and I’m still as busy as ever, playing a constant game of catch-up. I don’t do any marketing of my services – and thus most people don’t actually know what I do. This has actually been a deliberate ploy to shield myself from being overwhelmed by requests. However, with a baby on the way and us becoming solely reliant on the income I / the company brings in, this is going to have to change. The current setup is not going to be sustainable in the face of the challenges ahead. My time is limited and cannot be scaled. It’s time to rethink the way we work, and the manner in which the company is operated. It’s time to review the projects we’ve carried out these past two years and identify the areas that have the most potential moving forward (OK, so it was time to do that about 20 months ago!). It’s time to reflect on which services we have a natural talent for and to which we can bring unique additional value for our clients. It’s time to scrap those that make no business sense, and instead focus upon those that do to make them in some way the best available on the market. It’s also time to reconcile the relationship between Joseph Tame as a brand and Wild Tame Co., Ltd. as a company. How can they work together? How does my personal brand support the company’s goals? These are just a few of the questions we’ve been asking ourselves and exploring with our friends and advisors. Defining the answers has been an interesting process so far, and whilst we’ve not yet reached any overall conclusions, I can feel that we are making progress. We have at least started to figure out what we don’t want to be doing! Anyhow, I’ll leave it there for now. I imagine it will be another few weeks before we reach a point of clarity. In the meantime I’d like to thank all of those who have made time for us to talk over these things, and offer advice and insight to help us make more informed decisions.